An engaged and productive faculty is the heart of every successful university. The last round of climate surveys, coupled with work by the Faculty Senate and other committees, led to important changes on our campus. Much work remains, and it is important for the university to know about faculty concerns and needs in order to tackle it. This semester UNT is participating in two distinct and complementary surveys and faculty are urged to participate in both. The Gallup faculty satisfaction survey is just winding down. COACHE is a more in-depth survey focused on faculty engagement; it opens February 12. Robust participation will allow for much more effective decision-making. The 22 minutes COACHE is estimated to take to complete may be among the most important investments you will make this year. Last semester saw the roll-out of a new and improved Report-a-Problem application on all classroom computers. This allows faculty to request help during a class for problems ranging from the mundane (e.g., projector malfunctions) to the terrifying. This app is linked directly to UNT’s Emergency Operations Center, so first responders can react quickly to emergencies. This semester, a new layer has been added. 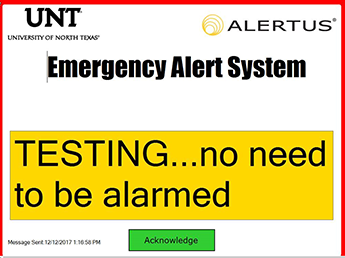 Alertus is an app that allows the Emergency Operations Center and UNT Police to communicate directly with faculty who may be unaware of ongoing emergencies outside their classrooms. Should an emergency arise, alerts can be pushed out to classroom computers within minutes. Alertus is flexible enough to permit campus-wide alerts or alerts to specific buildings or groups of buildings. Learn about opportunities for teaching, researching, and consulting abroad as well as hosting international Fulbright scholars at UNT. UNT-International is pleased to launch NationaliTEA, a social/mixer type of event for students, faculty and staff. Each mixer will highlight a different country with tea, snacks and activities. Faculty from WLLC will be at the Japan event to share info on the new Japanese major, Study Abroad staff will be on hand to discuss opportunities in Japan etc. Do you work with or advise international students or scholars in your department? Are you interested in learning more about hosting an international scholar or hiring an international employee? Join us for our upcoming workshop! Join UNT International Student and Scholar Services Office as we go over the need-to-know information about hosting an international student or scholar at UNT. During this presentation we will identify visa basics, resources for additional information, and the benefits to your department or division of engaging our students and scholars at UNT that hold F, J, or H1B status. The Teaching Excellence Spotlight is a monthly opportunity to recognize teaching excellence on our campus. Students, staff, and faculty can nominate UNT instructors of all ranks and disciplines for their contributions to student learning and teaching. You can nominate your colleagues, or even yourself, here. This month’s featured faculty member is Dr. April Prince, a Senior Lecturer in Music History, Theory, and Ethnomusicology. Read more about Dr. Prince and her approach to teaching here. Lynne Cox, Lecturer in the Department of Learning Technologies, enjoys working with the very intelligent. 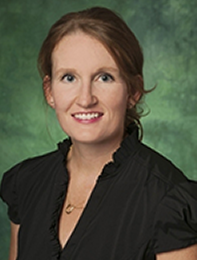 Before joining UNT’s faculty in 1998 she taught architecture to high school students at a magnet school, and at UNT has relished her interactions with very bright students and with departmental colleagues she describes as “heavy hitters.” Professor Cox says, “when you surround yourself with folks who are the best, you improve.” The courses she teaches represent her program’s “bookends”: graduate students just beginning their coursework, and those taking her program’s capstone courses. This permits her to observe their growth and maturation. 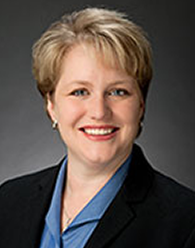 In addition to her busy teaching schedule, Professor Cox does her department’s course scheduling, handles graduate admissions, and counsels students on their degree paths and on career planning. Her belief in lifelong learning has led her to pursue a second doctorate in Logistics and Supply Chain Management (her first was in Applied Technology and Performance Improvement). Her passion for students is also evidenced by the joy she gets from participating in commencement ceremonies; she especially loves hooding graduates. Jongsoo Lee is an Associate Professor in UNT’s Department of Spanish. He joined our faculty in 2000 after completing his doctorate at Indiana University. His scholarship focuses on the literature, poetry, and cultures of indigenous Latin Americans. Several of his books considered the ways pre-Hispanic culture and history were reshaped as a result of the colonial era. His book, The Allure of Nezahualcoyotl: Pre-Hispanic History, Religion, and Nahua Poetics, represents a fresh look at Nezahualcoyotl, the 15th-century Aztec poet-king who died about 50 years before the arrival of Hernán Cortés. Professor Lee’s approach necessitated his learning to read Nahuatl, and indigenous pictorial texts. The ability to read codices and poetry in their original form allowed Professor Lee to counter the traditional representations of this leader that come to us from the perspective of the conquistadors. 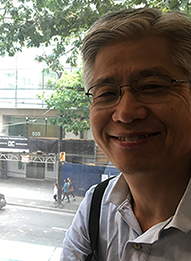 Professor Lee’s work is also distinct from that of other scholars in that his focus is on the history of indigenous people from the pre-Hispanic era through the present. Other scholars generally concern themselves on the colonial era alone. 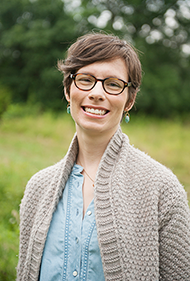 Terra Schwerin Rowe joined our faculty as an Assistant Professor in the Department of Philosophy and Religion last fall. Her research examines the impact, often unacknowledged or subconscious, of philosophical perspectives and religious beliefs on environmental values and practices. Last year saw the publication of her book, “Toward a Better Worldliness: Ecology, Economy, and the Protestant Tradition,” which explores how the Protestant concept of grace affects economic and ecological societal perspectives—particularly views on climate change. More specifically, this work explores intersections of economics, ecology, and the Protestant tradition through the shared terminology of gift discourse. She examines societal ideals of gift-giving (among humans and between the human and non-human world) and how these changed with the Protestant idealization of grace as a free gift. Although the ideal gift today is given altruistically (that is, freely or without expectation that anything will be received in return), it was not always so. Indeed, in many pre-modern societies an individual viewed gifts that he or she might give as extensions of his or her own personhood. As such, reciprocation was idealized, not simply as return of a gift, but as a return of relationship. In modernity the free gift is defined over and against exchange—both social/economic and ecological. Therefore, Rowe argues that even among Protestant groups with significant ecological and economic justice concerns, where grace continues to be defined as free of economy or exchange, the persistent nature/grace antagonism in Protestantism emerges once again with unfortunate implications for environmental and climate concerns. This is more than an academic exercise: Professor Rowe’s work led her to contribute to a community farming effort that connected the religious with those concerned with ecological issues and social justice. Congratulations to Sanjukta Pookulangara of Merchandising and Digital Retailing, winner of January's giveaway! 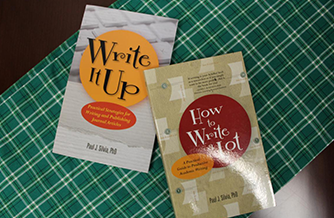 This month’s newsletter drawing will be for a set of books on academic writing authored by Paul Silva, Write It Up: Practical Strategies for Writing and Publishing Journal Articles, and How to Write A Lot: A Practical Guide to Productive Academic Writing. UNT faculty members who register by February 28 will be entered into this drawing. Please click here to register.